Private, luxurious Eureka Springs cabins just minutes away from town. We invite you to our enchanting Ozark Mountain resort! Spread out over 110 private acres, and surrounded by 1,000 acres of woodlands, our resort features seven Eureka Springs cabins with lovely views and modern amenities. 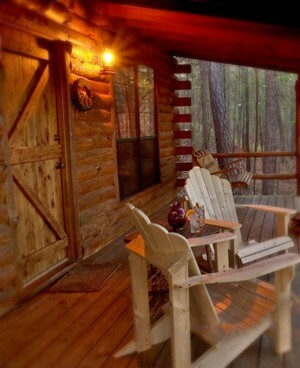 The cabins are placed on secluded points atop the ridge, with your private Arkansas mountain getaway in mind, and feature wildwood valley views from covered porches. You can experience all of the tranquility on Silver Ridge, just 5 miles from downtown Eureka Springs, Arkansas. Enjoy a romantic Honeymoon Cabin for two, or celebrate the good life with up to eight of your family and friends in one of our larger accommodations. All lodgings at Silver Ridge are equipped with full kitchens, inviting outdoor spaces, and most have jetted baths or hot tubs. If you bring your food, or have plans to enjoy the many culinary choices in nearby Eureka Springs, we have everything else well stocked for your comfort. No hustle or bustle – just peace and quiet. We welcome you to experience our charming location and exceptional amenities for yourself.